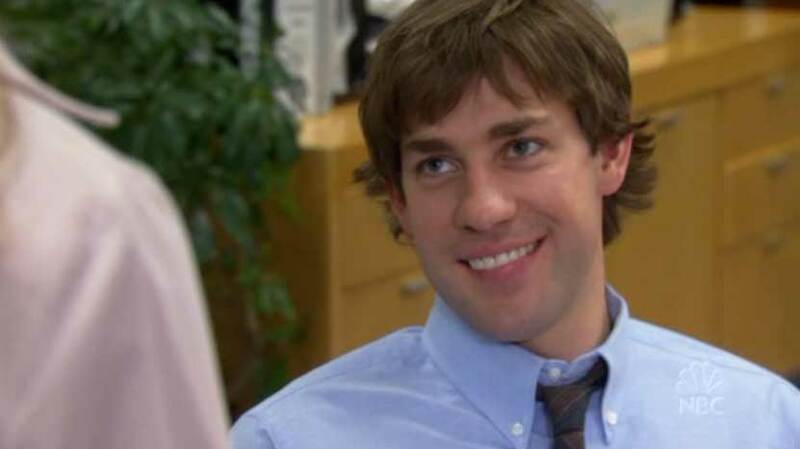 I’ve been so consumed with the Emmys (and ok, more honestly, my real job), that I totally forget that NBC is showing not one, not two, but three episodes of The Office tonight. Welcome to my personal heaven. For you Office-newbies, this is a great chance to see just how the second season of TV’s best comedy wrapped up as tonights eps were the final three shows of the season. And for all you kids wondering why all the critics were touting the season finale as one of the best of the season, well check out an encoure showing of “Casino Night”. You won’t be disappointed. I defy any woman watching “Drug Testing” not to swoon when she hears the word “Hi”. You’ll know what I mean. GMMR, after months of reading you talking about the office, I finally decided to watch it tonight. This show is hysterical. I can’t believe this is what I have been missing out on. That guy that works with the secretary. He’s really cute. Why aren’t they together? Oh no. I just started watching the 2nd episode and she is getting married? And not to the cute Jim guy? Who is she marrying? Can someone please fill me in. I’m so sad for Jim, he seems to really like her. The best investment you two can make right now is an iTunes account and all 28 episodes of seasons 1&2. All your questions will be answered. And you’ll be nuts like the rest of us Office fans. I love John Krasinski so much, that “hi” makes me melt! Oh that “Hi,” gets me every dang time! Melissa, i’m super psyched that you are starting to watch The Office! I get really excited when someone discovers it, that’s all. You should definitely watch the rest of the episodes (either through itunes or through the box set of season one…and when season two eventually comes out), so that you’ll be ready for season three when it starts. How exciting! I was just happy to see Casino Night again. And i agree, when Jim finally speaks after jinx….my goodness. Nice. Yeah, that “hi” was pretty awesome. 🙂 Also, the look on his face during the drug meeting – priceless. Did they cut out little parts of the episodes last night? They seemed a lot choppier to me than the first season (which I watched for the first time last weekend). I don’t know if it’s because there were commercials or what but I feel like there was stuff they weren’t showing me. I too have jut discovered the hilarity of The Office. Last night I was laughing out loud. Soooo Funny. I love the part in “Conflict Resolution” where because Michael says “redacted” everyone starts saying it. Dwight: “You redact, redact that right now.” Or something like that. Too funny. The comic about the restroom being for “Dwights Only” now takes on a whole new hilarity. I thought I was the only swooner with the “hi.” I thought to myself, how on earth can I swoon over him saying hi to her? But swoon, I did. Thanks for the affirmation that I am not alone! On the Casino Night episode they took out Creed winning the refrigerator. I was sad when they took out the mind control and AIDS bits, i love those two scenes! I’m just glad they kept in Creed’s stealing bit. So awesome. The hi is classic, particularly from Pam’s perspective. Plus her push, push, push on the soda can. Add her little smirk in E-mail surveillance when Jim says he hasn’t talked to Katy in a while and the way she nearly spills her guts at the end of the Dundies until she realizes the camera is on her. They’re the rare insights into Pam’s mindset that offset the way she shoots down Jim on Casino Night or how she is so defensively against snooping into office romances at the end of e-mail surveillance. The JAM thing would be so one-sided without such little snippets of Pam’s true feelings. I just watched the Drug Testing episode and I know EXACTLY which “Hi” you’re talking about. He is the man every woman wants to marry. That was the sexiest hi I’ve ever heard. Melissa, as you probably know by now, is engaged to Roy Anderson, a warehouse worker, in Season 2. As you probably know by now, in season 2 Pam is engaged to Roy Anderson, a warehouse worker.